Highlands Ranch Mom: Super Bowl Weekend! Although the Broncos didn't make it to the Super Bowl this year (and may not for a while by the looks of things) Super Bowl Sunday is still a very fun day for all football fans! 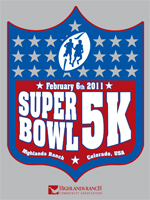 The HRCA has the Super Bowl 5K on Sunday, February 6th at 8:30am. Race day registration is $40. This is the first race in the 2011 race series. It may be cold outside but after you have run a 5K you won't have to feel guilty for eating chicken wings while watching the game :) For more information click here. The race will go on rain, snow, sleet, or sun! If you are looking for something filling and yummy for your Super Bowl party, try this recipe. It is really easy to make and it is sure to be a crowd pleaser. Brown ground beef, add onion and pepper. Stir in all remaining ingredients. Simmer for 2 - 4 hours. Enjoy!